I thoroughly enjoyed series one of Star Wars: The Clone Wars on not just TV but also on Blu-ray and season two has finally made it to Blu-ray. As opposed to commercial networks who have trouble screening episodes in order or even at all, the Blu-ray version is far superior because it collects all the episodes from season two. More importantly, the high calibre of quality from season one still remains and the plots are definitely more interesting in this collection. In terms of continuity, Star Wars: The Clone Wars takes place after Star Wars Episode II: Attack of the Clones and revolves around Obi-Wan, Anakin Skywalker and the awesome Ahsoka, the apprentice of Anakin who unfortunately was never in any of the movies. Nonetheless, this is all official and has the Lucasarts stamp of approval. The best aspect of Star Wars: The Clone Wars is that it appeals to all ages and is not just made for children. The sad aspect of Star Wars: the Clone Wars is that some of the episodes are actually far superior than some of the movies. It's also great to see a variety of the classic characters from the movies appear in this CGI created TV series. In terms of plotlines, the series fills some of the gaps from the movies as the Separatists attempt to thwart the Republic as they become embroiled in epic battles that is steeped in subterfuge. Ironically, season two focuses less on Count Dooko and General Grievous and the storylines expand this already engaging universe with some great new villains added to the mythology such as Cad Bane and Aurra Sing, deadly bounty hunters and assassins. Alhough the main stable of villains don't appear as often, they still do make some impressive appearances, especially the deadly Asajj Ventress who is easily the most impressive Sith ever created. The relationship between Obi-Wan and Anakin Skywalker is explored more in this series but the highlight is Ahsoka Tano (Ashley Eckstein) who really grows as a character as opposed to an innocent and reckless Jedi apprentice from season one. There's quite a bit of politics thrown into the mix as well with Padmé Amidala and Bail Organa constantly petitioning the senate for diplomatic solutions, unbeknown that the emperor is pulling the string. A special mention should be made about the supporting cast that include some colourful characters like Yoda, C3PO, Mace Windu and unfortunately Jar Jar Binks. In relation to Jar Jar Binks, he's actually more creative in the CGI series as opposed to that annoying movie counterpart... dare I say, almost likeable! To turn such a despised character around like that... the writers should be commended! With so many standout episodes, it's actually quite difficult to find a favourite but for me, it was Death Trap that introduced a young Boba Fett to the Star Wars mythology as he attempts to take down a few Jedi. Then you have those episodes which don't revolve around a main character but are just as enjoyable to watch. For example, The Deserter revolves around Rex searching for General Grievous and on his journey, he discovers a deserter and clone called Cut Lawquane. Cut left the army because he did not like killing and even started his own family. Thankfully all the stories comes together perfectly with the Star Wars mythology and although I'm an original fan, this series definitely proved that the Star Wars universe still had it. Brilliant writing and directing. On Blu-ray and on our Samsung Full HD TV, the video quality of Star Wars: The Clone Wars is amazing thanks to its high definition 1080p. The CGI is sharp and clear as are the colours and overall quality. With deep blacks, vibrant colours, I could not fault the video quality anywhere. And then you have the impressive Dolby Digital 5.1 surround track with boasts crystal clear dialogue, well use of the surround sound, especially for the sound effects and those majestic Star Wars scores with a truly modern twist. You really need to listen to this series loud to truly enjoy the overall experience because it definitely goes off. What about Special Features? They are definitely not lacking here from behind the scenes featurettes to a very cool 64-page journal and lots, lots more! Blu-ray Exclusive - The Jedi Temple Archives. An extensive database exploring special effects footage, early concept art, 3-D character and object turnarounds and early animation. The Archives is a rare look at the assets in various stages of creation for The Clone Wars, with a wealth of surprises and never-before seen moments sprinkled throughout. Behind-The-Scenes Featurettes on each disc. Attack of the Zillo Beast. 64 page production journal that includes early sketches, artist notes and concept art from Season Two of Star Wars: The Clone Wars. 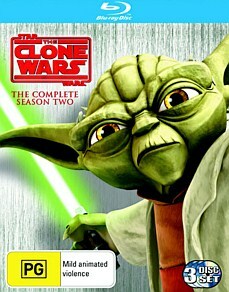 Star Wars: The Clone Wars just keeps getting better and better and season two is no exception to the rule. The writers of this series not only pay homage to the original movies but manage to incorporate many key elements from the mythology and films to create something that does not better than series but rather compliments and expands it. With Christmas almost here, I truly recommend this Blu-ray to all fans of Star Wars. If you don't know what all the fuss is about, watch the movies, then watch season one and then season two! Highly Recommended!